Clearwater Florida – Luckily for us Clearwater Real Estate market is not shaken by FOMC news today, when in its seventh meeting of 2010, the Federal Open Market Committee voted 9-to-1 to leave the Fed Funds Rate unchanged which is good news considering the extra toll the BP oil spill has already had on the Fl real estate market this year– we need our market to see continued improvements. So on a national level, The Fed Funds Rate remains at a historical low, within a Fed’s target range of 0.000-0.250 percent. So what does this mean for those looking to buy a Clearwater beach condo or home in Clearwater now? In its press release, the FOMC said that the pace of economic recovery “has slowed” in recent months. Household spending is increasing but remains restrained by high levels of unemployment, falling home values, and restrictive credit. For the 2nd straight month, the Federal Reserve showed less economic optimism as compared to the prior year’s worth of FOMC statements dating back to June 2009. However, the Fed still expects growth to be “modest in the near-term”. So if you’re like me it’s seems like everywhere I’m reading sentiment consistent with recent research showing that the recession is over, and that growth has resumed — albeit at a slower pace than what was originally expected. 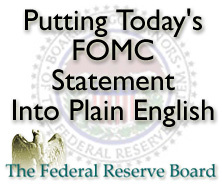 As expected, the Fed re-affirmed its plan to hold the Fed Funds Rate near zero percent “for an extended period”. There were no surprises in the Fed’s statement so, as a result, the mortgage market’s reaction to the release has been neutral. Tampa Mortgage rates in FL are thus far unchanged as of Tuesday afternoon. So for now, the Clearwater Real Estate markets were pretty much unaffected by the Feds statement but stay tuned for the FOMC’s next meeting is a 2-day affair scheduled for November 2-3, 2010. Call or email us today if you are thinking of selling your home or condo in Clearwater FL, Dunedin FL, Safety Harbor, Palm Harbor, Largo, Seminole, Tarpon Springs, Clearwater Beach FL, Belleair Beach, Indian Rocks Beach FL, Indian Shores, Redington Shores, North Redington Beach FL, Redington Beach, Madeira Beach, Treasure Island FL, St Pete Beach, Tierra Verde to The Inlets in Bradenton FL and Sarasota waterfront. Wondering what your Clearwater Home is actually worth today? Just call and ask us for a Market analysis for your house – in this dynamic market home values change day to day. Thinking of buying while Tampa Mortgage rates are still low and home values are down? Got any questions, just give us, your local Clearwater Real Estate Agents, a call or talk to your loan officer about locking your rate on the home or beach condo you want to buy. We’re passionate about being your Clearwater real estate advocate. We’re committed to delivering Results daily based on Integrity, Knowledge & Experience – helping you find the perfect Clearwater homes for sale – just call and ask. We’d like to be YOUR Clearwater Real Estate agents – specializing in luxury waterfront homes and condos! Cyndee, this is a very detailed and informative Clearwater real estate market news. As one of the top Clearwater Beach Short Sale Agents, this is a must read by every buyer and seller in your area. Thank you for sharing this. Hi Cyndee. Thanks for sharing a real estate market news of your area. Being someone who is an expert in the area and experienced as Clearwater Beach Short Sale Agents, you know very well how to explain the real estate issues of your area clearly and easy to understand.